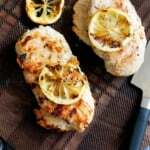 I’m a firm believer that every BBQ or party should have at least a few healthy choices available for guests to nosh on. No one wants to show up and only be served mayo-loaded potato salad, overly salted potato chips, hot dogs, cake from the grocery store and cantaloupe that tastes like it’s out of a GMO factory. Okay, maybe those are only the parties I’ve been to. Whomp whomp. 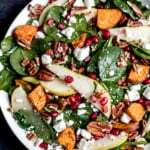 Still, it just might time to step it up a notch with an outrageously good salad loaded with fresh fruit, bright greens, toasty nuts and a to die for balsamic dressing. Wouldn’t you agree? 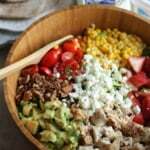 This salad was based off a recipe we enjoyed while we were back in Pensacola, Florida last November. We stopped by SoGourmet after a wine and cheese tasting and the chef delighted us with his famous SoChopped salad. At that point I felt as though I might actually burst, but decided that a few bites of the salad was required to be both appreciative and graceful. After all, he did make it for us. I thought maybe we were in a delirious food coma. I mean, could a salad really be THAT good? I wouldn’t know for sure until we made it back home and I attempted to recreate the salad myself. Turns out I wasn’t crazy. The salad surprised us with delight and flavor the second time we enjoyed it too, so of course I had to dub with the ultimate fruit, cheese and nut salad name. Just because. Wanna know what else this salad is? Versatile. Try it with peach and blueberries. Or perhaps juicy strawberries. Add in a little avocado if that’s your thing. Switch up the nuts to almonds or pecans. If you make this recipe, be sure to tag #ambitiouskitchen on Instagram, or leave a comment below to let me know how you liked it! xoxo! 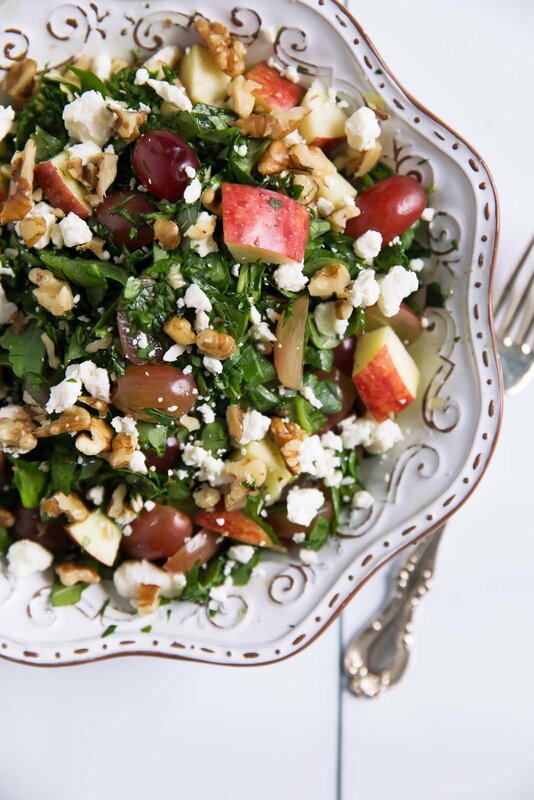 The ultimate fruit, cheese and nut salad packed with grapes, apples, toasted nuts, feta and a fantastic balsamic dressing. Easy to make & satisfying. In a small bowl, whisk olive oil, balsamic vinegar, garlic and dijon mustard together until smooth and well combined. 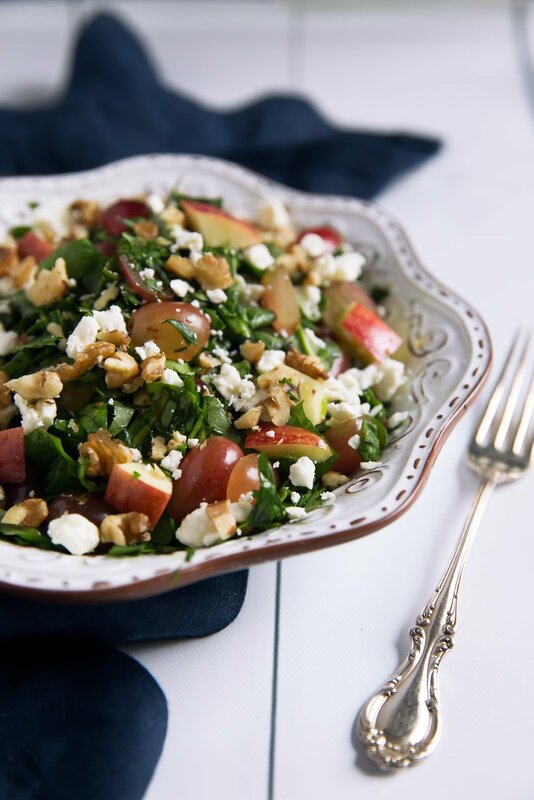 In a large bowl, toss lettuce, apples and grapes together. Pour dressing over the fruit and lettuce and toss again to combine. 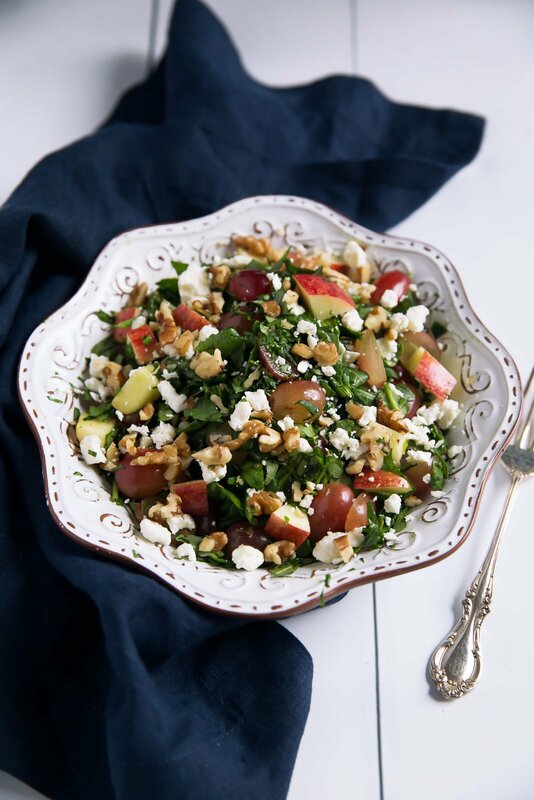 Top salad with feta crumbles and toasted walnuts. Serve immediately. Salad serves 4. 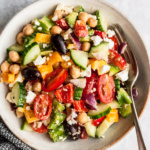 This salad is best enjoyed right after it is made. If you are bringing it to a party, I recommend waiting to add in the dressing, nuts and feta until right before you serve it. 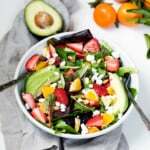 13 Responses to "The Ultimate Fruit, Cheese & Nut Salad"
I’m not sure if you’re going to Italy on your Europe trip, but if you do, you MUST order a fruit and cheese board because this salad reminds me of a fruit, cheese, and nut platter we had with some wine. Allllll the wine. 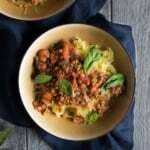 Such a delicious recipe Monique! I’ve been making this salad for years – add red onions for extra zing. I always get asked for the “recipe” but kind of feel its just whatever nut/fruit I have on hand. Feta is key. Yes, I will have to bring this along to our family’s 4th of July barbeque. And you are spot on with the blueberry and peach suggestion. Especially with a more traditional crowd. ?Watermelon might be my trial fruit, though. Mmmmm. Thanks for the healthy BBQ encouragement. This salad is a dream!! Love all the flavors, Monique! Fruit, nuts, and cheese mixed into a summer salad? Yes please. I need to make this ASAP. oh looks like a super delicious salad. I make a similar one with pomegranates. Love my salad time. I grow up thinking salad is boring but now its my fav meal! I actually had this CRAY-CRAY loaded salad with salmon, apples, mango, quinoa, edamame, curried cashews and a citrus vinaigrette on the side last night. I was so hungry that I ate it in one go and was stuffed! 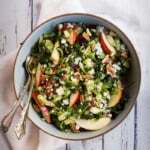 I think adding fruit into a savory salad now is an amazing idea–this is wonderful!